It's described on the box as "egg, cheese sauce & sausage in a buttermilk biscuit." 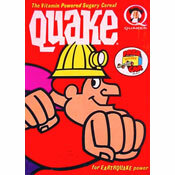 I'm afraid I wasn't the biggest fan of this product. The variety I tried was called Sausage & Cheese Grands! Biscuit Sandwiches. 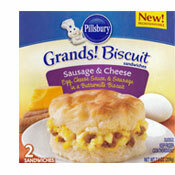 Pillsbury also offers this product in Bacon & Cheese and Ham & Veggies varieties. If you've tried any of them, I'd love to get your opinion below. The saddest thing about these biscuit sandwiches are the biscuits. What happened? 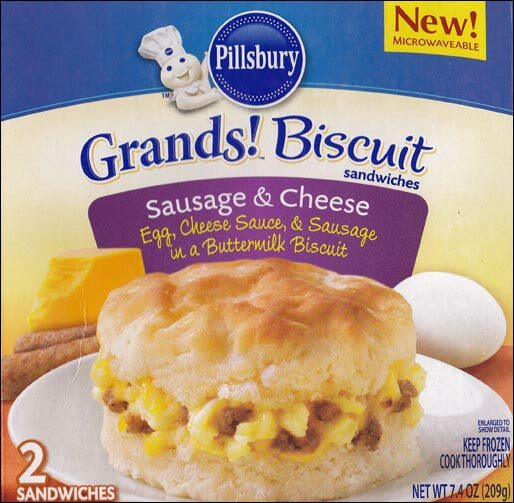 Pillsbury is the king of refrigerated and frozen biscuits. Purchased on their own, they're usually flaky and somewhat light. But as part of this sandwich, they emerge from the microwave heavy and dull. I could only describe them as "flaky" in the sense that you might call a person "flaky." The good stuff inside the breakfast sandwich? Well, it wasn't that good and there wasn't enough of it. The egg feels like egg, but doesn't add anything to flavor. The sausage crumbles were fine - nothing special. The cheese sauce should be called "cheese essence" - you sort of taste it but it feels more like a seasoning than a component. The BEST thing about these sandwiches is that they help you appreciate the taste of homemade breakfast sandwiches. If a McDonald's or a Burger King biscuit sandwich were challenged to a fight by these biscuits, the fast food biscuit would just laugh. There is no contest. Nutritional Information: Each biscuit sandwich has 280 calories, 16 grams total fat (9 grams saturated and 0 grams trans), 95mg cholesterol, 730mg sodium, 26 grams total carbs, 1 gram dietary fiber, 2 grams sugar and 9 grams protein. For a better Pillsbury frozen breakfast product, check out their Egg Scrambles. What do you think of Grands! Biscuit Sandwiches? Package is misleading. Not nearly that much egg and sausage. Could have been much better. Just okay tasting. We got some of the same ones you did had a coupon only paid $1.99 we were so disappointed. There was virtually no flavor at all. I will continue to make my own.